Ordinary to Extraordinary at the flick of a switch, a thousand different colours at your command. 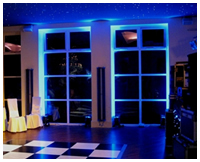 Uplighting also known as mood lighting creates an ambiance a presence a statement within any room, building or marquee. Dave Dee corporate mood lighting will add that sparkle to your corporate function, Product Launches, fashion show, talent competitions and theme evenings Using the latest in LED Technology, all our units are completely safe, use minimal power and omit no heat. With a wealth of experience in lighting and uplighting we would first arrange a site visit so we can get a true feeling for what you the client is hoping to achieve, next we would advise how we would bring to fulfilment your lighting requests using either LED Par Cans or one meter LED Battens, or maybe a mix of both. The par cans are more flexible however the battens are brighter and cover a larger area. These are a truly amazing addition to any event, using the superior Diablo XL range of machines the applications are endless! We have recently hired these units for Weddings, Proms, Themed Events, Corporate Events and Product Launches. They are a true talking point where ever they are used. The 2m Silk flame creates the illusion of a real flame, but uses absolutely no flammable products, normally supplied in pairs but single hires are also available, they are easy to set up and will run easily all night. 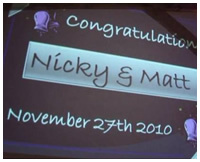 The possibilities are endless, projectors aren't just for presentations, they can serve a variety of other purposes!